A man has been jailed for five years for a fire at Birmingham's Wholesale Market. Stephen Robert Wilkinson, 60, who worked there from the age of 15, was found guilty of arson following the blaze in August 2015. Wilkinson, of Mickleton Close, Redditch, was convicted of setting fire to a pile of boxes, causing damage to the venue totalling more than £500,000. He started the fire as part of a row with a rival, the court was told. Birmingham Crown Court heard the rival also collected boxes at the market. Some 40 firefighters tackled the blaze at its peak in Digbeth. Image caption Stephen Robert Wilkinson denied arson but was found guilty. The court heard he set fire to a pile of boxes. The judge, Kristina Montgomery QC, said she believed Wilkinson's motive was an act of "petty revenge" against the rival. She said she understood he may not have realised just how quickly the fire would spread, but nonetheless he had endangered the lives of market traders and firefighters, who had to go into a dangerous building with a fragile roof. Wilkinson offered no explanation to the authorities as to why he started the fire, the judge said. But she said she was not going to restrict him from going back to the market in order that he would be able to work there in future if his employer wanted him to. Wilkinson is set to be released on licence after serving two and a half years. In mitigation, his barrister, Martin Butterworth, said Wilkinson was a "simple man" who was devoted to his family and he had never been apart from his wife. Birmingham City Council facilities manager Sue Round estimated the total loss as being £505,951.40. 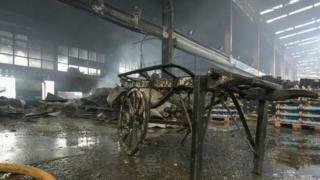 The fire left parts of the market closed for several days following structural damage and stock destroyed.